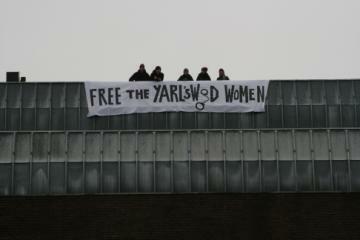 Probably everyone is aware of what is happening at Yarl’s Wood. This month there have been 3 other developments in the use of Detention in the UK which highlight our Governments attitude towards it. In fact, as noted by Alasdair Mackenzie of the Immigration Law Practitioners’ Association: ‘The process rushes a person through the decision-making process without time to gather the necessary evidence’. So here are 2 pretty mainstream organisations directly criticising the UKs detention programme. Specifically the fast track system and specifically it’s effect upon women. In particular Human Rights Watch focuses upon the effect of detention upon the vulnerable and the traumatised (the last people we should be denying protection to). When people are fast-tracked they are not provided with the time or the conditions they need to build trust and discuss their major experiences of persecution. And so their claims are often missing the most important bit. Essentially they are silenced by the violent nature of detention, rushed through a complicated legal process and ejected as quickly as possible from the country. And we are asked to believe that this is ‘firm but fair’ decision making. So what is the UK government response? 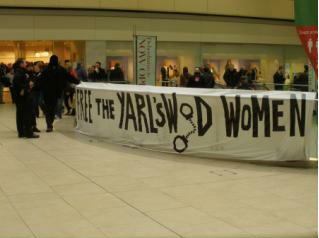 To these reports, to the many other criticisms, to the hunger strikers at Yarl’s wood who are resisting this violence by starving themselves until enough people decide that this is an outrage? The Home Office is to opt out of a European directive which lays down minimum standards for the treatment of asylum seekers. A directive which exists ‘to ensure that the applicants have a dignified standard of living’. It looks like the British Airways numbers are different.